Reps. Tina Pickett and Sandra Major presented a condolence resolution honoring the late Kenneth B. Lee, who served as speaker of the House, to his wife, Marjorie. Speaker Lee passed away on Dec. 23, 2010. A special House ceremony honored Lee and his contributions to the General Assembly. 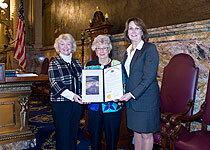 Former Speaker Kenneth B. Lee was posthumously honored and remembered April 6 by the Pennsylvania House of Representatives, where he served in the top leadership position, said Reps. Tina Pickett (R-Bradford/Sullivan/Susquehanna) and Sandra Major (R-Susquehanna/Wayne/Wyoming), sponsors of a special condolence resolution that the House passed that day. Present at the ceremony were his wife, Marjorie; his sons, Scott, Cole and Kenneth; his daughters, Laura and Susanne; and eight grandchildren; as well as several close friends. During the ceremony, Lee was recognized for his work to modernize the chamber. He served on the Commission for Legislative Modernization and the 1968 Pennsylvania Constitutional Convention, established the House Ethics Committee and new ethics restrictions, and inaugurated the nation’s first Legislative Data Processing Center. Lee was elected to the House in 1956 and served as majority leader in 1963 and minority leader in 1965. He was elected speaker of the House for the 1967-68 and the 1973-74 sessions. Also speaking at the ceremony were Speaker of the House Sam Smith (R-Jefferson/Armstrong/Indiana), Majority Leader Mike Turzai (R-Allegheny), Minority Leader Frank Dermody (D-Allegheny), and Lee’s son, former Rep. Kenneth E. Lee. Speaker Lee, remembered as being a true statesman in every sense of the word, was cited for his indelible mark on the institution of the House of Representatives, his commitment for the people of Pennsylvania and for the great respect bestowed upon him by the House membership. He was also known for his quiet determination and ability to make forces join together, as well as his belief of a professional chamber that would benefit from the collective knowledge and experiences of its members.